My research interests are focused on infant cognitive development. I am specifically interested in the development of visual attention and recognition memory in the first year of postnatal life. 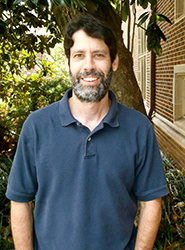 Greg Reynolds currently serves as director of the Developmental Cognitive Neuroscience Lab. Research in the lab is focused on the development of attention in infancy, and the impact of developmental change in attention on perceptual preferences and recognition memory. Multiple psychophysiological and behavioral measures are integrated into the majority of experiments run in the lab in order to gain greater insight into early development. This approach is being used to examine three areas of research: brain-behavior relations and the development of attention, individual differences in infant visual attention, and the role of experience in the development of attention. We are currently investigating possible relations between the development of neural systems involved in the control of eye movements and individual differences in infant visual attention. This research, funded by the National Science Foundation, is examining the possibility that infants who demonstrate more mature visual attention and efficient information processing capabilities may develop voluntary control over their eye movements at an earlier age than infants who demonstrate less mature patterns of visual attention. We are also starting a new line of research in the lab in collaboration with Dr. Daniela Corbetta examining neural activity and visual scanning behavior involved in early reaching behavior. This research, funded by the National Institute for Child Health and Human Development, involves the integration of event-related potentials, eye-tracking, and reaching analyses within each session of infant testing. Reynolds, G.D., & *Romano, A. C. (2016). The development of attention systems and working memory in infancy. Frontiers in Systems Neuroscience, 10, 1 – 12. Reynolds, G.D. (2015). Infant visual attention and object recognition. Behavioural Brain Research, 285, 34 – 43. Reynolds, G.D., Bahrick, L.E., Lickliter, R., & *Guy, M.W. (2014). Neural correlates of intersensory processing in 5-month-old infants. Developmental Psychobiology, 56, 355 – 372. *Guy, M.W., Reynolds, G.D., & *Zhang, D. (2013). Visual attention to global and local stimulus properties in six-month-old infants: Individual differences and event-related potentials. Child Development, 84, 1392 – 1406. Reynolds, G.D., *Zhang, D., & *Guy, M.W. (2013). Infant attention to dynamic audiovisual stimuli: Look duration from 3 to 9 months of age. Infancy, 18, 554 – 577. Reynolds, G.D., & *Guy, M.W. (2012). Brain-behavior relations in infancy: Integrative approaches to examining infant looking behavior and event-related potentials. Developmental Neuropsychology, 37(3), 210 – 225. Reynolds, G.D., *Guy, M.W., & *Zhang, D. (2011). Neural correlates of individual differences in infant visual attention and recognition memory. Infancy, 16 (4), 368 – 391. Reynolds, G.D., Courage, M.L., & Richards, J.E. (2010). Infant attention and visual preferences: Converging evidence from behavior, event-related potentials, and cortical source localization. Developmental Psychology, 46 (4), 886 – 904. Richards, J.E., Reynolds, G.D., & Courage, M.L. (2010). The neural bases of infant attention. Current Directions in Psychological Science, 19(1), 41-46. Reynolds, G.D., & Richards, J.E. (2009). Cortical source localization of infant cognition. Developmental Neuropsychology, 34 (3), 312-329. Courage, M.L., Reynolds, G.D., & Richards, J.E. (2006). Infants' visual attention to patterned stimuli: Developmental change from 3- to 12-months of age. Child Development, 77(3), 680-695. Reynolds, G.D., & Richards, J.E. (2005). Familiarization, attention, and recognition memory in infancy: An ERP and cortical source localization study. Developmental Psychology, 41 (4), 598-615. Reynolds, G.D., & Lickliter, R. (2004). Modified prenatal sensory stimulation influences postnatal behavioral and perceptual responsiveness in bobwhite quail chicks (Colinus Virginianus). Journal of Comparative Psychology, 118, 172-178. Reynolds, G.D., & Lickliter, R. (2003). Effects of redundant and non-redundant bimodal stimulation on heart rate in bobwhite quail embryos. Developmental Psychobiology, 43, 304-310. Reynolds, G.D., & Lickliter, R. (2002). Effects of prenatal sensory stimulation on heart rate and behavioral measures of arousal in bobwhite quail embryos. Developmental Psychobiology, 41, 112-122. Reynolds, G.D., Courage, M.L, & Richards, J.E. (2013). The development of attention. In D. Reisberg (Ed. ), Oxford Handbook of Cognitive Psychology, pp. 1000 – 1013. Oxford University Press: New York, NY. Reynolds, G.D., & Richards, J.E. (2008b). Attention and early brain development. In R.E. Tremblay, R. deV Peters, M. Boivin and R. G. Barr (Eds. ), Encyclopedia on Early Childhood Development. The Centre of Excellence for Early Childhood Development. Reynolds, G.D., & Richards, J.E. (2008a). Infant heart rate: A developmental psychophysiological perspective. In L.A. Schmidt & S.J. Segalowitz (Eds. ), Developmental Psychophysiology: Theory, Systems, and Methods, pp. 173 - 212. Cambridge University Press.